Dr. Robert Russell is the founder and Executive Director of Cartoonists Rights Network International. Dr. Russell’s lifelong commitment to human rights and dignity began as a Peace Corps volunteer in the 1960’s. He went on to spend over two decades in Africa and Asia as a consultant in institutional development and humanitarian assistance. After founding CRNI in 1999, he has served as the organization’s Executive Director. In 2012 the Association of American Editorial Cartoonists presented Dr. Russell the Ink Bottle award, for his outstanding contributions to the profession of editorial cartooning. When he’s not working on furthering CRNI’s mission and influence, “Bro” (as his friends and colleagues call him) is an enthusiastic student of the American Revolution and is as interested in the technical and human implications of space flight. Joel Pett is a nationally syndicated editorial cartoonist, and winner of the 2000 Pulitzer Prize for political cartooning. He has also received the Robert F. Kennedy Journalism Award for outstanding coverage of the disadvantaged, and the 1995, 2007, 2010 and 2011 Global Media Award for cartoons on population issues. In addition to serving as President of CRNI’s board of directors, Mr. Pett is a former President of the American Association of Editorial Cartoonists, and serves on the board of MyBillofRights.org, the Bill of Rights Monument Project. Joel has worked at the Lexington Herald-Leader since 1984. Carl Nelson is president of NEI Communications, Inc., a Massachusetts-based public relations firm specializing in technology products and services. He is the founder and Executive Director of the Cartoon Art Association, as well as being an associate member of the National Cartoonist Society and the American Association of Editorial Cartoonists, and a trustee of the Meland Foundation. Mr. Nelson has also been responsible for creating promotions for charity sponsorships that have raised more than one million dollars for the USO and the Fisher House Foundation. Terry Anderson is a professional cartoonist and caricaturist. For more than fifteen years he produced comics and illustrations for The Glasgow Herald and for twenty has been co-ordinator at the Scottish Cartoon Art Studio. 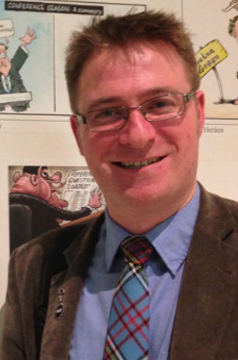 In 2014 Terry organized an international cartoon exhibition on the Scottish independence referendum – The Auld Acquaintance – that was shown in six venues around Europe. The Scottish Cartoon Art Studio’s Fizzers® caricatures were the subject of a ten year retrospective exhibition at The People’s Palace & Winter Gardens, Glasgow in 2016/17. A former student of The Kubert School of cartooning, Terry is a member of the UK Professional Cartoonists’ Organisation and The Cartoon Movement. For a decade he served on the executive committee and ultimately as President of the Scottish Artists Union, the trade union for all visual artists working in Scotland. He is frequently asked to broadcast, speak publicly and lead workshops on the subject of cartooning. Nikahang Kowsar is an internationally known editorial cartoonist, currently published via Rooz Online, Yahoo! Canada, Cagle Cartoons, and the Cartoonists and Writers Syndicate. Mr. Kowsar is an Iranian exile living in Toronto, Canada, and the 2001 recipient of CRNI’s Courage In Editorial Cartooning award. He is also a four-time winner of the Crystal Pen and Honorary Diploma award from the Iranian press, and co-founded CRN Canada. Matt Wuerker is the editorial cartoonist and illustrator for Politico.com, and winner of the 2012 Pulitzer Prize for political cartooning. Mr. Wuerker’s Op Ed illustrations are syndicated by the Tribune Syndicate and NewsArt.com. His cartoons have also been published in journals ranging from The Nation and The American Prospect to Z Magazine and Funny Times, and including major papers like the Los Angeles Times, The Washington Post, and The Christina Science Monitor. He is a proud member of Sarah Thaves’ CartoonistGroup. We thank Matt for designing our logo.